The blueberry is a fruit that grows wild in fresh areas of the N hemisphere. It is a bluish-black, rounded berry measuring 6mm of diameter. It is mainly consumed in jams, cakes or as garnish for various dishes. It is rich in vitamins and it supplies very few calories. Fresh blueberries are beneficial to treat various gastrointestinal disorders. The dry abstract helps to restore cardiovascular affections; the blueberry capsules are beneficial for sight problems. The blueberry pulp is aromatic, juicy and somewhat acid. It contains multiple small brown seeds. 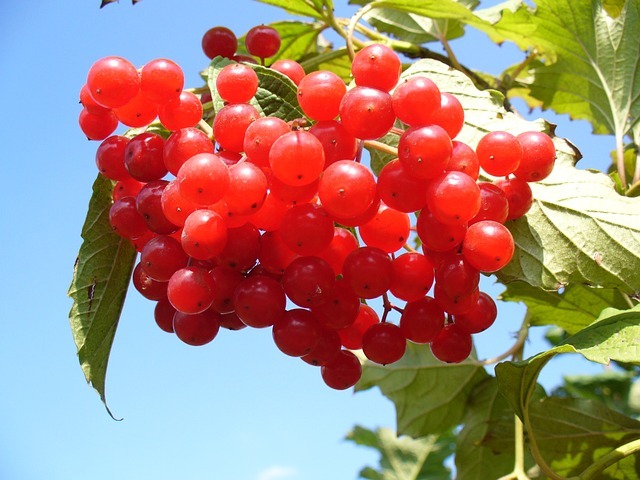 In the upper part, this fruit has a small crown that differentiates it from the black currant. The blueberry is eaten as table dessert, although it is chiefly intended for the processing of several product like jam, puree, stewed fruit, jellies and juices. It is also dried and frozen. In some countries it is even fried or cooked for making soups. As raw fruit they are part of fruit salads and they are eaten with cereals, crepes and waffles. They are eaten with cream, orange juice or with a drop of Grand Marnier, a liquor made with orange. The cranberries are used to make buns, bread, pies, cakes and sherbets. They are garnish for turkey dishes. The blueberries are rich in vitamin A and C, and they supply very few calories, since they contain few fats and proteins. They are rich in anthocyans, some substances that are beneficial for the digestive apparatus. The black blueberry is a plant with long crawling roots emitting multiple branched trunks. It requires fresh climates to have a correct development. 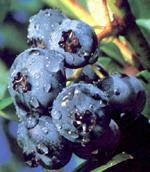 It bears rounded berries of 5mm of diameter of a dark blue, almost black colour. The common blueberry or European black blueberry belongs to the family of Ericaceous, and its scientific name is Vaccinium myrtillus. The leaves are deciduous and alternate, between 1 and 3cm long. The have oval or elliptical shape, with a pointed apex and sawed edges. They are of a vivid green colour, somewhat paler on the reverse, although in autumn they acquire an intense purple and yellow coloration. The flowers hang solitary or grouped, and they are of a white-pink-greenish colour and between 5 and 6mm long. The fruit is a rounded berry of 5mm of diameter and of almost black purple- blue colour. The have an even skin showing a characteristic circular scar in the upper part. The juicy, clear pulp is composed of a great number of very small seeds. This plant requires fresh climates, with well-distributed rainfall and cold enough in winter, so as to enable a good flowering and production.